Buy, Rent or Skip End of Watch? The best way I can describe End of Watch to the average person on the street is it's kinda like COPS in that everything looks and feels like a reality series. Instead of a camera crew following both Brian Taylor (Jake Gyllenhaal) and Mike Zavala (Michael Peña), they film themselves while on patrol. Even though nothing really "happens" for the first hour, it's still interesting. It's kind of like riding in the back of a Cop car, watching a 'day in the life' of two partners as they make their rounds. Enough interesting stuff happens to keep one engaged, but there is clearly no major plot arc at work though. So, you're just along for the ride. It's not until the half way mark does the story finally reveal itself and we get a whiff of what End of Watch will become. I won't say anything more in case you guys haven't gotten a chance to see this for yourself. But I will say that the dynamic between Jake and Michael is fantastic. They have a chemistry and a bond that translates well on camera, making the ride along's fun and engaging. The epilogue itself is a great example of their onscreen friendship and definitely the funniest moment in the film. 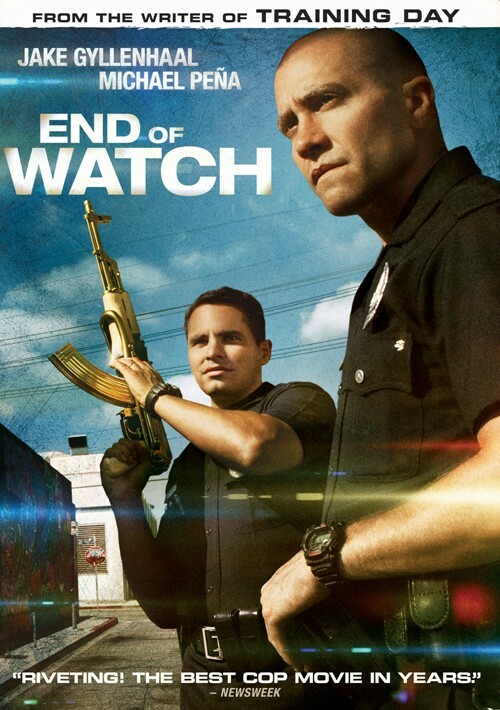 If you like movies like Colors and Training Day, I urge you to give End of Watch a chance. Adding to the must-see movie is Natalie Martinez, Anna Kendrick and America Ferrera. A shout-out to my boy Mac, give this one a shot. Disregard the hand-held camera photography. The characters more than make up for that and the 3rd act plays out like a mission from GTA, so you will get your fill of high octane adrenaline fix in a high intensity showdown. I was gonna ask you about the shaky cam. Okayyyyyyyyyyyy, I'll give it a try. I've been avoiding this like the plague because of that.